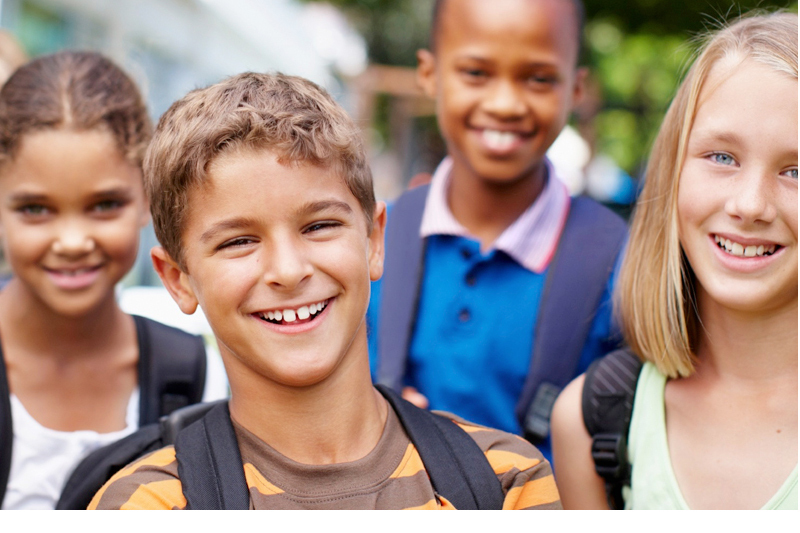 make a real difference in their schools and community. The conference is open to senior student leaders from invited schools on the North Island. Conference fee includes supervised accommodation, meals, all workshops, guest speakers, a personal mentor and workbook. ‘Rangatira’ is comprised of two Maori words – Raranga (meaning to weave) and tira (meaning a group of people). 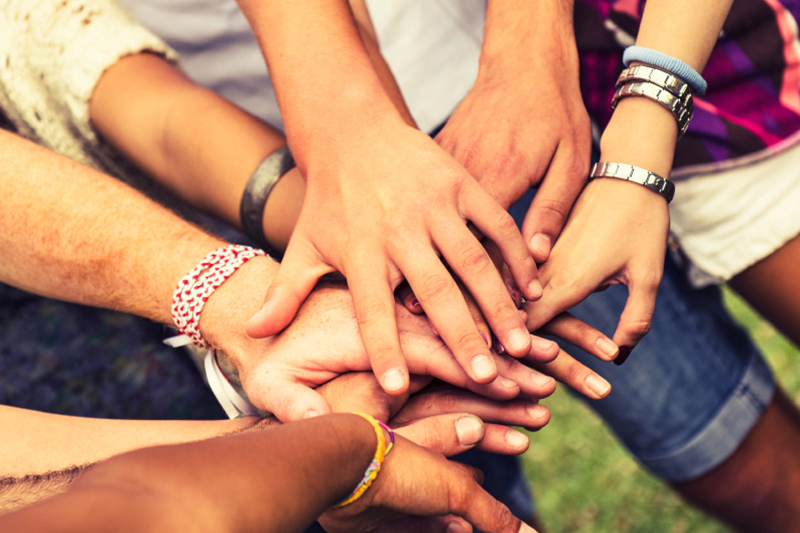 Rangatira translates to the word leader – someone who can bring people together towards a common goal. 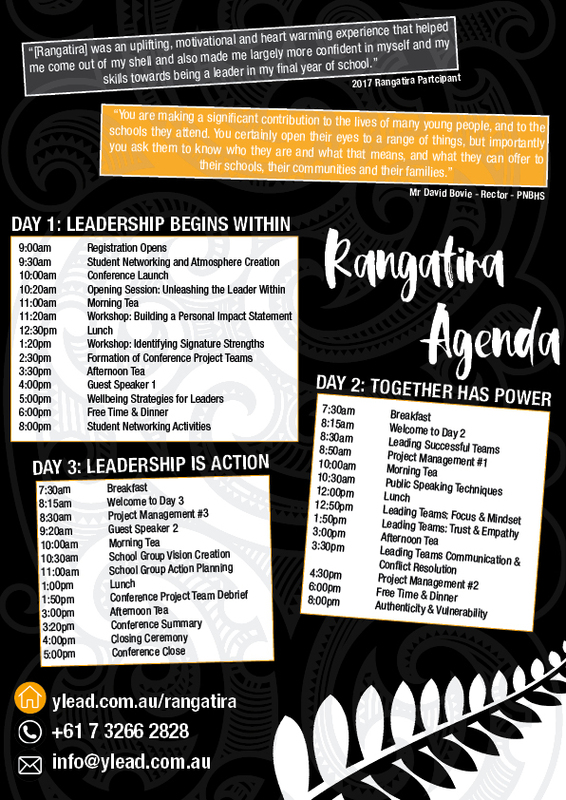 Launched in 2012, Rangatira: The New Zealand Student Leadership Conference was an initiative inspired by Kelsey Crew, Liam Hae Hae and Shaquille Graham of Rotorua Boys’ High School. These three young men attended yLead’s signature event, The Australian Student Leadership Conference in Brisbane, where they developed a vision of bringing the experience to New Zealand. Rangatira is an opportunity to gather and develop the finest young leaders from across the North Island. Speakers for 2018 are yet to be confirmed, please find following a sample of guests that presented at Rangatira in the past. Noa grew up on the Kapiti Coast, and was head boy of Aotea College in Porirua. Becoming a young parent at 16, he experienced first-hand the negative stereotypes that many teen parents face and wanted to do something about it. 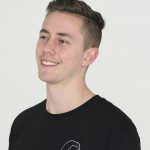 Noa learnt about social enterprise and was inspired to set up the clothing company Increase NZ, which uses profits to help support teen parents to experience life-changing youth development opportunities. Rowie is the founder of THE MAX, a group of Private, Prestigious and Exclusive International Fitness Businesses Colleges in Australia and New Zealand. Her business was listed in BRW magazine’s list of The Top 100 fastest growing companies in Australia. 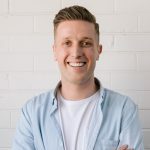 From runaway teenager to self-made millionaire, Rowie shares how to do what you love, stand out from the crowd (for the right reasons) and be fit, healthy and strong. To register your students for this to be a part of this unique opportunity, please complete the registration form. yLead will provide a link for students to provide dietary, medical and other personal information closer to the event. 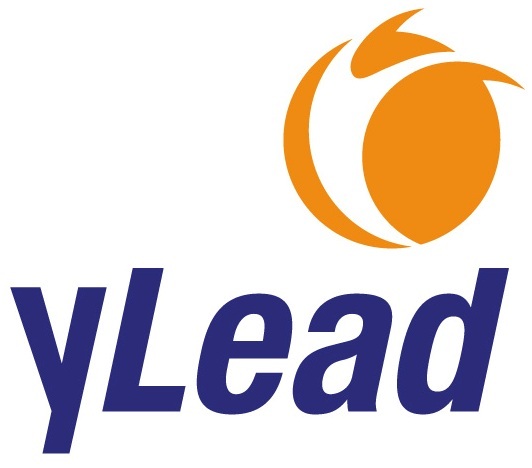 The yLead team will supervise students throughout the entire conference experience. Males and females will be housed in seperate supervised accommodation overnight. Students requiring leave from the conference will need to provide written permission from their parent/guardian. School staff are not required to attend the event. However, we are more than happy to welcome you throughout the conference. We are also able to arrange a meals and accomodation package if required. We strongly encourage you or other appropriate staff member/s to attend Rangatira on Day 3 (Sunday 7th October). Conference participants will be led through a vision and goal setting workshop. It is a great opportunity for you to sit down with their students and work together on building a strong 12month leadership vision for your school. Can I send students that are have not yet been elected into leadership positions? Yes! Rangatira is an incredible experience for all senior students. The conference will suit students considering applying for leadership, stepping up to leadership or wanting to expand their personal leadership skills. No. You can register numbers of students once registration opens, specific names and student details are due on Friday 7th September 2018. No. It is however a great conference for a number of student leaders to experience together. Schools send anywhere from 4 elected leaders to a pool of 14 students applying for leadership positions. 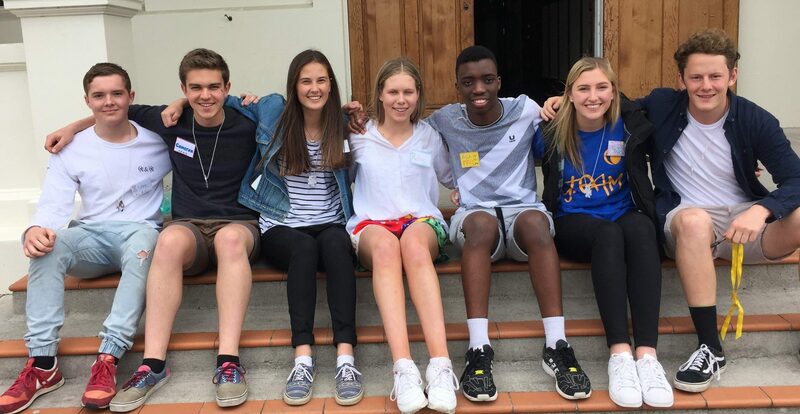 When a group of students experience Rangatira together they become a more united team that has a greater ability to implement their ideas and share their knowledge with others. Through this amazing experience I have not only grown as a leader but also a person. I am so glad I was lucky enough to be a part of this experience. The conference was fast paced, challenging, placed students outside of their comfort zone and made them think positively and passionately about how they can individually and as a team influence the direction of their school. This conference has made a huge impact in my life. You all helped me one way or another to become a better leader and role model for our younger generation. I found it hugely beneficial and I definitely think it equipped me better as a leader. I loved the bonds I was able to create with new people. Overall, one of the best experiences ever! The overall experience has been like nothing I’ve done before. I thoroughly enjoyed making new connections and learning more about what being a leader is all about. The mentors were open and approachable and made me feel that bit more relaxed. Rangatira was really different. I had not idea what to expect coming in, but I know it wasn’t this! So challenging and rewarding. One of a kind experience I will remember for a long time. Very unique and enjoyable. I found it challenging at times but this was good and made me gain more self confidence. It was a worthwhile and memorable experience.